Jennifer Kocher of Chester, New York, stormed to a victory in the $30,000 Battenkill Grand Prix, , riding Carlos on July 14, during the 25th annual Vermont Summer Festival, held at Harold Beebe Farm in East Dorset, Vermont. Mealiff also picked up third riding Itile Horta, owned by Huygens, with just three time faults keeping them from the jump-off. After a banner two weeks at the Vermont Summer Festival, Matthew Metell of Wellington, Florida, produced the fastest four-fault trip in the first round to finish fourth riding Donchalant for owner Wolver Hollow. David Jennings of Franklin, Tennessee, rounded out the top five riding Gracieux Van Seven Oaks, owned by Mary Katherine Hargreaves, with four faults in the opening round. 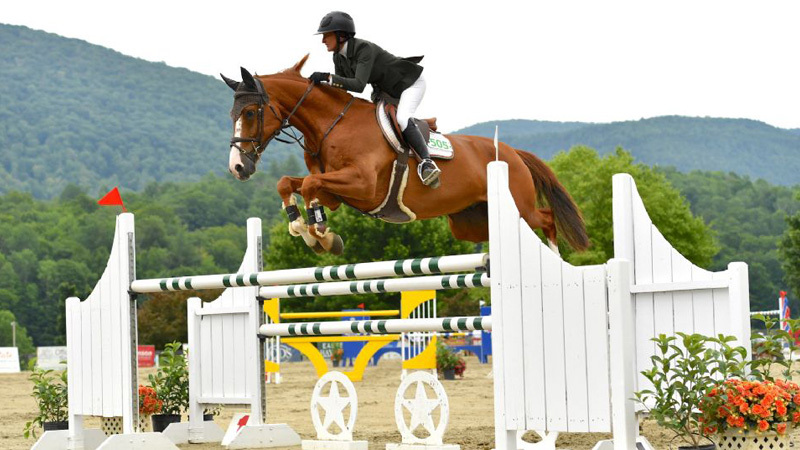 Jennifer Kocher won the $30,000 Battenkill Grand Prix riding Carlos on July 14, at the Vermont Summer Festival. Photo by Andrew Ryback Photography. “We bought Carlos off a video two years ago,” said Jennifer of the 11-year-old Dutch Warmblood gelding (Carthino Z—Winde Kind, Wolfgang) formerly piloted by Dutch rider Peter Geerink. “Andy bought him as a horse for him to ride, but he has turned out to be perfect for this level as well as the high amateurs. I started showing him in Florida this year, and he was really big and strong for me; I didn’t think I was going to be able to ride him.